Photo by Capt. Brian Holaway. Southwest Florida summer weather is here, along with all the beauty that comes with it―rain, clouds, lightning, flowering plants, mosquitoes, no-see-ums, rainbows, spectacular sunsets and warm water. Afternoon summer clouds are stunning, dangerous, ever-changing and beautiful, a photographer’s dream and a boater’s nightmare, forming as heat rises over the Everglades. Marjory Stoneman Douglas once said that “there are no other Everglades in the world.” Well, take that into consideration when you think of the wild weather patterns we get here in the summer. The heat rises over the vast expanse of the Florida Everglades and the clouds start to build, head a little farther to the north then out towards the barrier islands of Southwest Florida. We can watch these cumulonimbus clouds grow from 2,000 feet at the base to over 10,000 feet, sometimes in minutes. 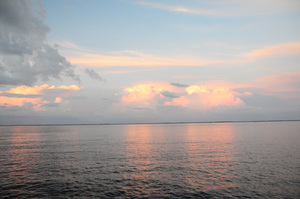 Boating guidance about building and bubbling cumulonimbus clouds is “when in doubt, chicken out,” advice from the late Captiva fishing guide Butch Cottrill. 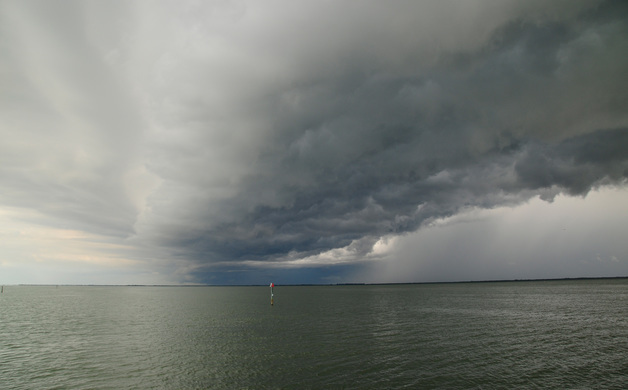 The cumulonimbus cloud at its apex starts to let out moisture at a rapid rate, sometimes at a sideways angle with a sting. The storms come on fast and leave fast. Then all is still on the water and the smell of the fresh rain fills the air. Plant life immediately starts to utilize the moisture of a huge drink of afternoon rain. The two plants that I find amazing in this process are sea oats and beach morning glory, also known as railroad vine. Both are dune plants, also called pioneer plants because they are so hardy in a salty and high energy area of the beach. The root structure and rhizomes of sea oats (Uniola paniculata) help stabilize beaches by capturing drifting sand. Sea oats is one of the first protected plants because of its ability to help create and keep the natural beach. 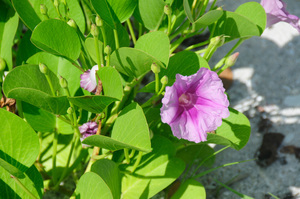 The railroad vine (Ipomoea pes-caprae) has a beautiful purple flower, is one of the most important dune plants in Southwest Florida, its long vine literally growing overnight after the rain. The stems that grow on the beach can sprawl perpendicular to the dune and help trap sand, helping to create new beach and habitat for other dune plants such as sea oats. All of this beauty is going on right under your feet and in the sky. I hope you get a chance to enjoy the beauty of summer weather in Southwest Florida. Whether it is the sky painted by the clouds, the sand gathered around an outstretched railroad vine or watching the wispy sea oats swaying back and forth on a secluded beach, whatever you do, just get out there in the wild. Written by Captain Brian Holaway, a Florida master naturalist and is a Southwest Florida shelling, wildlife and eco-tour guide. His boat charters visit the barrier islands and beaches of Pine Island Sound, including Cayo Costa State Park, Cabbage Key, Pine Island and North Captiva.